Insular Life and Sense for Money recently inked a leasing agreement for PRAXIS, a board game specially designed to promote money management in a risk-free environment. The Power of Gamification - The idea is to use game attributes to drive a play – like behavior. Through the magic of play, complex financial concepts such as Financial Literacy become clear and easy to understand. Initiating conversations about money, insurance and investments can either be intimidating or overwhelming thus, it requires creativity and relevance. This game ensures high level of engagement to make learning fun, easy, interactive and flexible. PRAXIS is a one-of-a kind board game providing a unique experiential gameplay that involves players through a simulation of their financial lives that revolves around the business cycles. With time compression, players are able to fully experiment life while at play. In the world of Praxis, one can make or lose money, go on a vacation, get hospitalized, prepare for retirement, make loans and do career planning. From basic financial concepts such as budgeting and saving, players are able to experience more complex ones like insurance planning and investment in stocks. All the critical financial decisions in a fun game play. The game is being controlled by an accredited Game Master. He drives the game and uses various announcements, life events and promotions to add fun in learning. Insular Life has already held two Game Masters (GM) and Game Facilitators (GF) Accreditation sessions last February 24 and May 16-17, 2017. Only the accredited GMs and GFs will be conducting and facilitating the game. Since April, board-game sessions are being held nationwide for employees and Financial Advisors as part of the company’s strong efforts to promote financial literacy and for better appreciation of the game. 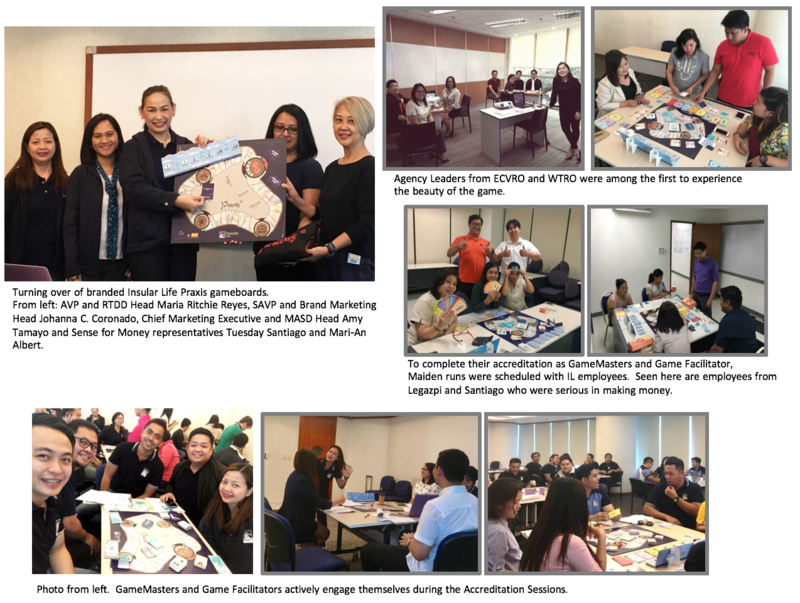 Employees from the Branch Management Division (BMD) and PHSD and Agency leaders from Visayas and Mindanao were among the first groups to play the game. While one of its purpose is to generate potential client leads, a Recruitment version of the game will also be introduced soon.